In the style of traditional American folk art, the body of each bird is cut from a single layer of 3/4" pine. 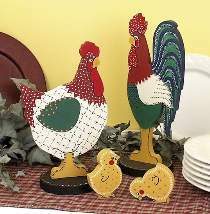 This plan includes FULL SIZE patterns for all chickens pictured as well as complete painting instructions and paint color suggestions so you can create the same look as is as pictured. Rooster stands 14"H.